Water-colour drawing by James Tillyer Blunt of a budgerow in a squall on the Ganges, taken from a n album of 31 drawings (29 folios) of landscapes in Delhi, U.P., Bihar, Orissa, Madras and Mysore. Between 1788 and 1800. Until the coming of the railways in the nineteenth century, transport up-country in Northern India was largely done by water. The Ganges was a large and dangerous river to navigate because of the fast currents, rocks, sandbanks and falling cliffs along its course. Sudden storms could wreck boats. 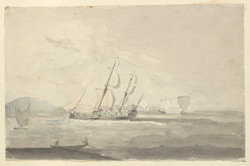 This watercolour depicts a pinnace budgerow, a type of boat frequently used in those times, with big sails and living quarters.